Port Hope Public Library's goal is to support extensive and comprehensive library programming and outreach that meets the diversity of needs in the community, and that supports the Library's collections and service mandate. The Library actively partners with other community agencies, organizations, educational and cultural institutions, or individuals to develop and present co-sponsored public programs. The Library's philosophy of open access to information and ideas extends to Library programming with all programs open to the public and largely offered free of charge. Port Hope Public Library approaches programming with innovation and vision, which has been recognized provincially as the recipient for two consecutive years of the Ministry of Culture's Angus Mowat Award of Excellence in Public Library Service. There are a wide variety of fun, informative and entertaining programs available at the library. See the details of the program by clicking on the title of program below. Family Storytime is designed for children up to 4 years old accompanied by a parent or caregiver. Storytime is a half hour of fun, storytelling, rhyming, finger plays, song and sometimes dance. This is a chance to discover some new and old-time activities with your little one, to meet other parents, and bring new stimulation into your child's life. It’s all about enjoying books, stories and rhymes, seeing pictures and experiencing playful interaction. Family Storytime is held on Tuesday mornings at 11 a.m. in the Program Room at the Mary J. Benson Branch and Thursday mornings at 10:30 a.m. at The Hub in Canton. You can let us know you're coming by calling 905.885.4712 or email. If you would like to see what’s involved just drop in to try it out. There are Fall, Winter and Spring sessions and each session lasts eight weeks. For specific dates please refer to What’s On or our Events Calendar. One-to-one attention can make a big difference. The Library offers free help to students in kindergarten to grade 8 who have been identified by their school as having reading and math skills below grade level. Students register for a two week session and attend every weekday for one hour. Tutors in reading help students improve their skills through new word lists, daily journals and other reading-based games and activities. Math tutoring provides extra help to students through worksheets, number games, flash cards and other math-based activities. Tutoring is also available in the French language. Learning takes place in a relaxed atmosphere. Parents are given written reports and are asked to complete a program evaluation at the end of their child’s session. Places are limited and are filled on a first come, first served basis. The tutors do not teach reading or math. They provide structured practice for students needing extra help. Attendance is important. Participation for the full two weeks is necessary so that children receive the maximum benefit from the program. Registration normally begins each year in May. Parents are required to fill in a registration form available at either branch of the Library. Children registered for the program must have a valid Port Hope Public Library card. For further information, please contact Alison Houston at 905.885.4712 or email. A group dedicated to discovering who dunnit! Mystery Readers Book Club members want to solve the crime and figure out who the culprit may be. Cozy mysteries, police procedurals, thrillers, hard boiled detectives and a little bit of true crime are discussed monthly along with a cup of tea and a cookie. Book club titles are ordered through the Library’s interlibrary loan service. Warning - attendance may be habit-forming! Port Hope Public Library Book Club is a lively collection of readers who meet to mull over a monthly book selection. Literary fiction, nonfiction, family sagas and memoirs – in fact, any book is fair game. The good-natured discussion ranges from the sublime to the ridiculous. Meetings are open to all. Book club titles are ordered for members through the Library’s interlibrary loan service. Free, no ticket required! Every month another themed lineup. Classic movies, award winners and perennial favourites the way they were meant to be seen - on The Big Screen. From Spencer Tracy to Steve McQueen, Audrey Hepburn to Annie Hall, the Library’s Tuesday film program offers up a smorgasbord of great movies. Join our faithful audience for an enchanting escape into the best of Hollywood’s comedy, drama, western, suspense and mystery films. Cookies and large-screen immersion provided. Movies run every Tuesday afternoon at 2 p.m. from September through June in the Program Room of the Mary J. Benson Branch. Please check the What’s On or our Events Calendar for a complete listings of dates and times. Calling All Corrie Fans …. Come by for a cuppa, some street talk and a trivia quiz with prizes. Three times a year at our Coronation Street PING fans of the long running British serial get together to celebrate all things Corrie. A ‘PING’ is a gathering of fans of the Street and our gatherings are full of fun so seating is on a first come, first serve basis. The event is held on a Monday evening at 6 p.m. in the Program Room of the Mary J. Benson Branch. Please check the What’s On or our Events Calendar for program dates and times. Treats and prizes are courtesy of our sponsor Pharmasave, 60 Ontario Street in Port Hope. The Library thanks them for their very generous support of this program. 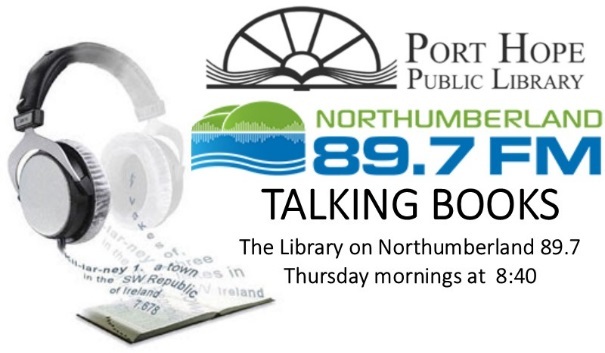 Northumberland 89.7 morning host Jim Glover and Library staff chat Thursday mornings at 8:40 am about Library resources, programs, and events. Listen to Truly Local Radio all about your public library. February 15th, 2018 - Listen Now! February 1st, 2018 - Listen Now! January 25th, 2018 - Listen Now!